Summary: An uplifting novel about the families we create and the places we call home. 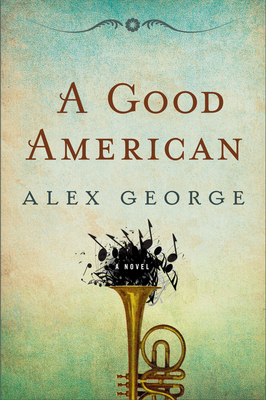 I started noticing a lot of buzz surrounding the new novel A GOOD AMERICAN by Alex George. It first started receiving some pretty impressive accolades including #1 Pick for Indie Next List, Amazon's Best Books of the Month List, and Barnes and Noble Discover Pick. Then reviews around the blogosphere started coming in and I quickly realized that I needed to drop everything a pick up this book. And that's just what I did. I basically sat down on the couch and read A GOOD AMERICAN... almost in one sitting. I was mesmerized by this story and I truly loved it. So I have to wonder why it's so difficult for me to express my appreciation for this novel. I have no problem gushing about it, but it's hard for to articulate my adoration in words. I think one of my initial reactions might sum it up the best -- there wasn't a page of this novel that I didn't love. You know how you can really like a book but there's one or two little things that you didn't love? Or, there might have been a part of the book that was a little slow for you? Well, A GOOD AMERICAN was one of the most enjoyable (and easiest) books that I've ever the pleasure of reading. Everything about this novel just worked for me! I think one of the best things that I can say about A GOOD AMERICAN is that it entertained me. I loved the characters and their actions, and I was riveted to the story of their lives. But it was how much this book affected me that brought it to the next level. I was surprised by how much humor was incorporated into the story, and I did laugh out loud on more than a few occasions. However, I also found this story to be extremely touching. My heart broke over and over again for this family's struggles. Yet, what I think I appreciated the most was how I was inspired by the characters' determination to make it in a new country. It made me realize how much my great grandparents (and great great grandparents) sacrificed for the future of their families. I truly can't rave enough about Alex George's storytelling abilities. I admit that I am drawn to family sagas and immigration stories, but this novel far exceeded my expectations of a multi-generational tale. Mr. George created some of the most unique and memorable characters that I've encountered in recent reading; and while they were definitely quirky, they also seemed very real to me. Even when I didn't love a particular character, I was still interested in learning about his or her life. And as far as narrators go, I thought James was fantastic. I loved his voice, his perspective and his sense of humor; and I also loved how he led up to and revealed the surprise ending. I think part of the reason that A GOOD AMERICAN will be so successful is because it resonates with reader. Almost every American family has an "immigrant" story and relatives that will remind them of the Meisenheimer family. However, this novel also explores so many universal themes about family, love and what it means to be an American. It's just one of those books that will make you laugh and cry, but it will also warm your heart! I'm sure this next statement won't surprise you, but you should strongly consider A GOOD AMERICAN for your next book club selection. Since there are so many universal themes about family and home, it definitely lends itself to discussion. There is a reading guide available with fourteen thought-provoking questions and the author is even available for Skype chats. I honestly can't think of a book that I'd rather discuss right now. Some of the topics you might want to explore include patriotism, love, family, obligation, honestly, secrets, and grief. However, there is also a great deal of symbolism in this novel which also would be interesting to analyze. Wholeheartedly, 100% agree. Great job! Awesome review. Wow. You spoke for me and for many readers. Truly, it's a near-perfect novel. I've been seeing nothing but raves about this book! After your review and Jenn and Candace's comments, I want to pick the book up right now and do nothing but read it. Of course it is fantastic, it is Amy Einhorn! I have the audio sitting right *here*. I just need to load it and listen. Your review has me completely jacked about it now! Wow! Your review makes me want to run out and get this book! this sounds like a great book for a book club. Awesome...thanks. Sounds a fab read. Every page was so good to you, then it should be the same for me. Plus I like the change of venue to New Orleans rather than the stated NY, NY. Thanks for bringing this to my attention Julie.